With the summer days drawing to a close, the pool may not be frequented as often as it used to. But, that is no reason to neglect it! Your inground pool could require leak and crack repairs if not properly maintained. Use an algaecide that stays in the water for a long length of time. On the last day of operation, add this to the water and run the pump cycle for a full day to properly circulate it. Then shut down for the winter. Drain the water from your pump, pool heater and filter. If water freezes in these parts they can crack and will have to replaced. A dirty but safely covered pool beats a sparkling clean but uncovered pool anytime. There simply is no better insurance for keeping toddlers and wildlife out of the pool. As soon as the weather starts to warm up in the spring, lift the corner of your pool cover and add chlorine. This will prepare your pool for summer use. An improperly fitted cover could open and expose your pool to the elements, undoing all the work you’ve done to maintain it. A warmer autumn and winter could require more chlorine and algaecide in spring to reduce the algae bloom. 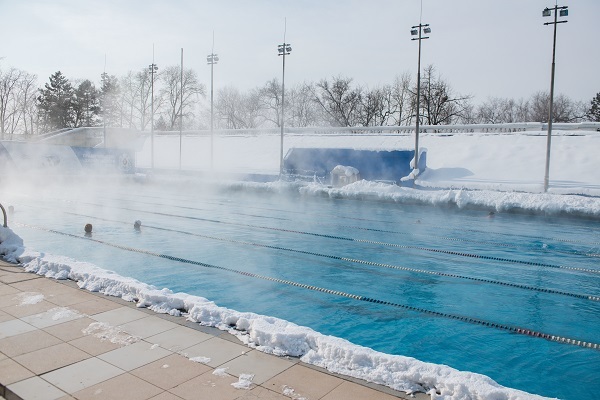 A colder winter season cure requires maintenance on your pool systems due to freezing. A chemical enzyme will break down the contaminants that will inevitably find their way into your pool. Contaminants such as bird droppings, pollen, and dead leaves. The enzyme chemical will also help prevent the formation of the waterline ring which could save you a lot of elbow grease in scrubbing. If leaves, sticks and other organic matter clutter your pool cover, they could create an indent and you’ll end up with a nasty slew of stagnant water which could make its way into your pool. Check that your cover remains firmly secured, that it is clean and fitted. Also, check the water level of the pool. A reducing water level could indicate a leak. Uncover your pool early in the spring before it gets too hot. A hot covered pool acts as a greenhouse for algae to bloom. We, at Mr. Pool, hope you found this guide helpful and wish you many hours of happy swimming in the summer. If you fear you may have leaks or cracks in your pool, contact us now to repair them!